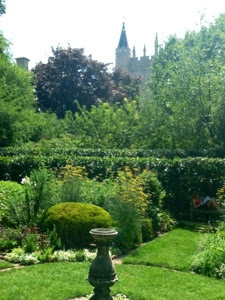 I took a midsummer day's tour of the Shakespeare Garden at Northwestern University in Evanston, Illinois, during my recent trip to sweet home Chicago. The garden, tucked in between Hawthorn trees and tall hedges on campus near the Frank W. Howes chapel, is 95 years old and is on the national register of historic places. Looking up at the castle-like structure with spires in the background, for a brief moment it looked a little more like the Bard's native England instead of the Chicago area. Ah, well it looks more like the back drop of Chicago from this vantage point. And it certainly felt like Chicago with temperatures in July reaching almost 100 degrees and the humidity seemed just as high. of reading in the shady nooks of this lovely garden. Eight garden beds fill a 70 by 100 feet garden plot that is divided in half both by turf grass and a sundial. The beds are divided by pavers and boxwood hedges. The garden was designed by renowned landscape architect Jens Jensen in 1915 in response to the Drama League of America's suggestion to plant gardens to commemorate the 300th year of William Shakespeare's death. It was also considered a gesture of wartime sympathy for British allies and to celebrate strong ties between the United States and Great Britain. popped up in the United States. 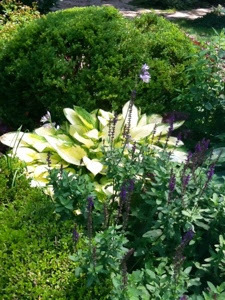 This one is maintained by the Garden Club of Evanston. possibly a bronze bust of the famous poet. 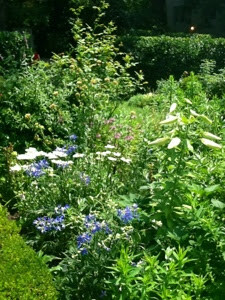 At this garden, Jensen planted lots of the flowers Shakespeare mentions in his works, such as balm, broom, carnation, columbine, cowslip, daffodils, daisies, flax, lavender, lilies, mallow, marjoram, pansy, peony, violets and wormwood. Some of them you might recognize and others you might not. You might be inspired to google some of the plants Shakespeare writes about, like I was (for example from the opening quote above, apparently woodbine is honeysuckle and eglantine is sweetbriar, or a rosa rubiginosa). for its beauty or scents. Beautiful garden, and at first glance I did think of England! And I love the quotes! Jeannine, I so enjoyed to "tour this garden with you". I am surprised how lush it is considering the temperatures that you are mentioning, but the humidity seems to do the trick. 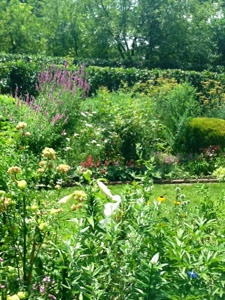 The garden is so well maintained, just a feast for the eyes. It must be great to have a public garden like this near by! My connection to nature is intrinsic not academic. I'm not very good at remembering flower names. I do know that other gardeners look at me strangely when I can't name a particular flower in my own garden.